When young men in their twenties turn older, the concentration of the 'bad cholesterol' LDL in their blood increases - and so does the concentration of the triglycerides. This means that their blood vessels clog up and calcify faster. However, these age-related effects are smaller the fitter the men are, reported American biostatisticians in the Journal of the American College of Cardiology. The researchers used the data of 11,418 men aged 20-90 who were collected in the Aerobics Center Longitudinal Study. The researchers had the men run a treadmill, and determined their levels of cardiorespiratory fitness. At the same time, they looked at the concentration of HDL, LDL and the triglycerides in their blood. These blood parameters are still important predictors of the risk of cardiovascular disease. The men's blood parameters were directly related to their age. When young men became middle-aged, the levels worsened. The concentration of the triglycerides, the 'bad cholesterol' LDL and the ratio between 'bad cholesterol' LDL and 'good cholesterol HDL was at its worst when the men were in their forties. However, for all ages, fitness reduced the deterioration of cholesterol levels due to aging. The fitter the men were, the healthier their values. In the non-fit men, at the age of 30 the LDL level was already at a level that cardiologists consider to be sub-optimal [130 mg/ l]. For the fit men, this sometimes happened 15 years later - and very often it didn't happen at all. "Independent of time, varying lifestyle, and metabolic characteristics, a higher cardiorespiratory fitness has a significant contribution to maintaining favorable lipid and lipoprotein profiles, especially in young to middle-aged men," the researchers conclude. "Therefore, promoting cardiorespiratory fitness may contribute to a possible delay or dyslipidemia and its related atherosclerosis and cardiovascular disease." J Am Coll Cardiol. 2015 May 19;65(19):2091-100. 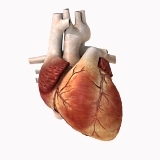 The aging process makes the heart muscle become stiffer, and the amount of oxygen-rich blood that the left ventricle of the heart muscle can pump into the body decreases. The possible end result? Heart failure. If overweight people with a sedentary lifestyle start to get more exercise - and we're not talking about sports, but simply light activities like walking and standing - the positive health effects are almost immediately measurable. Indeed, physical exercise improves cholesterol balance, keeps your weight healthy, lowers blood pressure and reduces the chances of developing diabetes. But even if you filter out all these effects, exercise still increases life expectancy.